Is skiing like ‘riding a bike’? The meaning of the English expression ‘like riding a bike’ is that ‘once you have learnt how to do something then it is easy to do it again even if you have not done it for a while’. Whilst riding your bike on a straight piece of road with a perfect surface may be easy to do if you have not ridden your bike for a while, imagine being at the top of a mountain bike run when you have not been down a rough and bumpy trail recently, how will you feel ? Can you just launch yourself on your bike down this track? I don’t believe so unless you have daredevil tendencies…….. This is my dilemma at the start of each ski season. 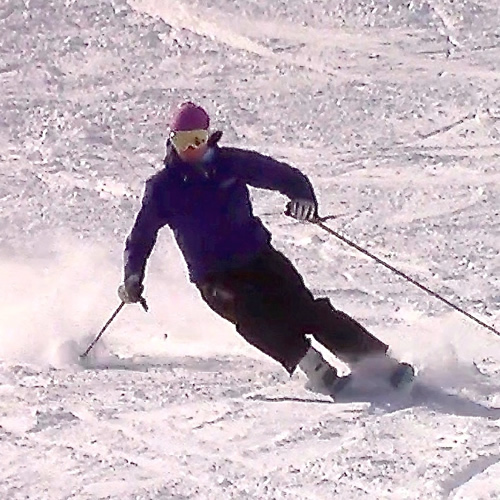 I have been skiing for over 30 years, yet each season my level of fitness varies, the snow and condition of the ski runs can be very different and I go out to experience my first runs of the season with some trepidation as I am certainly not a daredevil! So how do I get over my nervousness at the start of a season? Firstly I try to do some additional sport before the season starts. No sport uses exactly the same muscles so doing a variety of activities is really worthwhile; a combination of swimming and Pilates or yoga to build flexibility together with ‘riding a bike’ either at a spinning class or outside in the fresh air to build stamina will help prepare your body for the upcoming season. Secondly after a couple of short ski sessions just finding my ski legs, I sign up for some private lessons with an experienced instructor. This means that I do not get into bad habits at the start of the season and it definitely builds my confidence. Lessons are also fun and a great way to find new runs and to see different parts of a ski resort. Most resorts will make some changes to their lift system or ski runs each season and an instructor can show you the changes while ensuring that you have good technique and can build on your capabilities ready for the season ahead. This season I will book my ski lessons with the new Verbier ski school Alpinemojo. All the instructors are very experienced and really love to teach. Their enthusiasm for skiing is infectious so I hope that this will pass onto me and I will get a great start to the season. By the way, I don’t only take lessons at the start of the season. If the conditions change, I don’t have a good day up the hill or I have friends coming to visit who ski a lot better than me, I will take another lesson and build up my confidence even more. Lessons should always be fun and who would not want to be ‘on the piste’ in one of the most beautiful ski areas in the Swiss Alps. https://alpinemojoskischool.com/wp-content/uploads/2016/08/Rosie-Wranek.jpg 500 500 brightdesign https://alpinemojoskischool.com/wp-content/uploads/2018/06/AlpineMojo-Long-No-Bckgrd-1-300x80.png brightdesign2016-10-23 19:29:252018-04-05 06:25:28Is skiing like ‘riding a bike’?